Nowadays many applications offer in-app chat and messenger features to their users. The in-app messenger can be useful for things like live support chatting or in-app messaging with other application users. In this article, we are going to explore how to use Pusher Chatkit (which is in beta at the time of writing this article) and SlackTextViewController to create a chat application. 💡 SlackTextViewController is a drop-in UIViewController subclass with a growing text input view and other useful messaging features. It is meant to be a replacement for UITableViewController & UICollectionViewController. Assuming you have all the requirements let us start. Go to the Chatkit page, create an account and create a Chatkit application from the dashboard. Follow the “Getting Started” wizard until the end so it helps you create a new user account and a new chat room. In that same screen, after you have completed the “Get Started” wizard, click on “Keys” to get your applications ‘Instance Locator’ and ‘Key’. You will need these values to make requests to the Chatkit API. That’s all! Now let us create a backend that will help our application in communicating with the Chatkit API. Before we create our iOS application, let us create a Node.js backend for the application. The application will talk to the backend to do things like retrieve the token required to make requests. Open your terminal and in there create a new directory where the web application will reside. In this web application, we will define some routes that will contain logic for making requests to the Chatkit API. In the code above we have a sample Express application. The application has 2 main routes. The /users route creates a new user using the Chatkit API. The created user can then request a token using the /auth route. Tokens are used to validate the identity of a user making a request to the Chatkit API. Remember to replace *PUSHER_CHATKIT_*``*INSTANCE_*``*LOCATOR* and *PUSHER_CHATKIT_KEY* with the actual values for your Chatkit application. You can find the values in the “Keys” section of the Chatkit dashboard. 💡 You may want to keep the terminal window open and launch another terminal window to keep the Node.js server running. 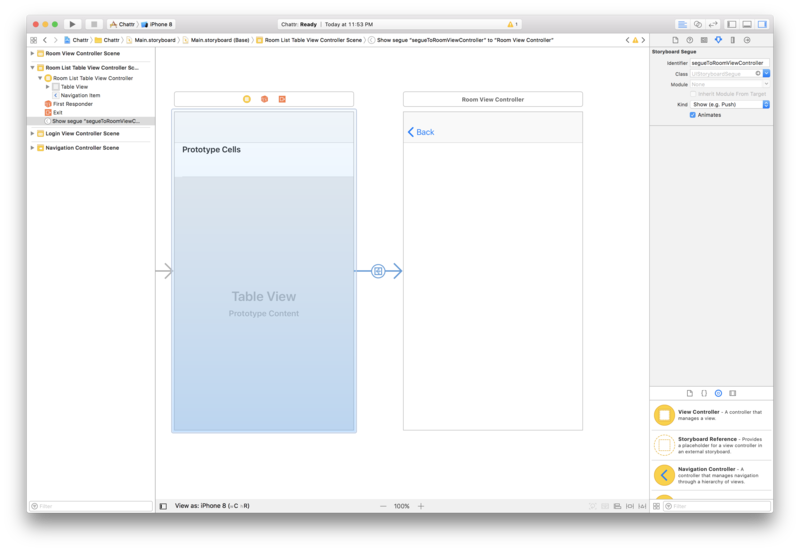 Launch Xcode and create a “Single View App” project. Now run pod install to install the dependencies. ⚠️ SlackTextViewController has a bug in iOS 11 where the text view does not respond to clicks. Although it’s been fixed in version** 1.9.6, that version was not available to Cocoapods at the time of writing this article, so we had to pull the master in the Podfile. When the installation is complete, open the new .xcworkspace file that was generated by Cocoapods in the root of your project. This will launch Xcode. static let ENDPOINT    = "http://localhost:4000"
static let INSTANCE_LOCATOR = "PUSHER_CHATKIT_INSTANCE_LOCATOR"
In the AppConstants struct we have defined the ENDPOINT and INSTANCE_LOCATOR. The ENDPOINT is the URL to the remote web server where your Node.js application resides. The INSTANCE_LOCATOR contains the instance locator provided for your Chatkit application in the Pusher Chatkit dashboard. Now let us focus on creating the storyboard and other parts. In the code above, we have defined two @IBOutlets that we will connect to the View Controller scene in the storyboard. In the prepare method, we prepare for the navigation to the RoomListTableViewController by setting the username property in that class. In the loginButtonPressed handler we fire a request to the Node.js application we created earlier to create the new user. Open the storyboard and link the first scene to the LoginViewController class. Add a UIButton and a UITextField to the view controller scene. Now connect the UITextField to the textField property as a referencing outlet and also connect the UIButton to the loginButton property as a referencing outlet. 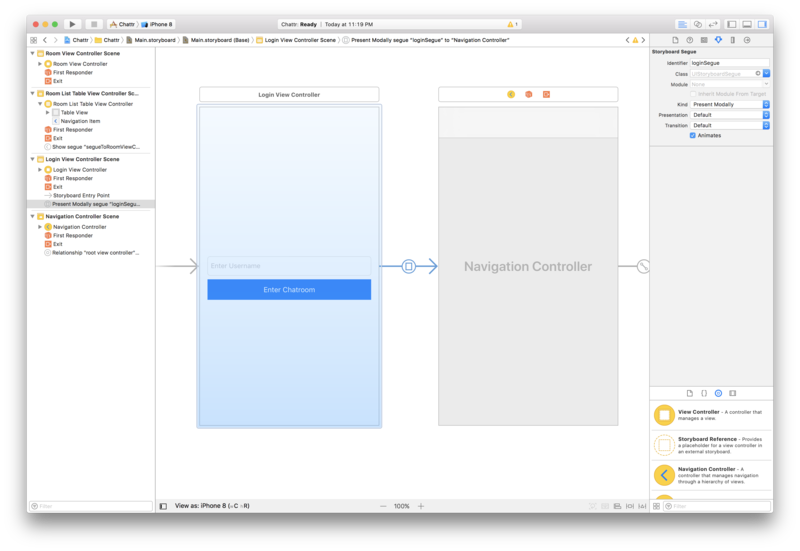 Next, add a Navigation Controller to the storyboard. Create a manual Segue between the View Controller and the Navigation Controller and set the ID of this segue to loginSegue. // Get a list of all rooms. Attempt to join the room. This class is meant to show all the available chat rooms that users can connect to and chat on. Let’s see what some parts of the class do. The first extension contains the initializers. In the viewDidLoad method we set up the controller title, activity indicator, and Pusher Chatkit. In the initPusherChatManager, we initialize a tokenProvider which fetches a token from our Node.js endpoint. We then create a chatManager with our Chatkit application’s instance locator and the tokenProvider, and connect to Chatkit. In the second extension, we override some table view controller methods. We do this so we can display the channel names in rows. In the last method of the second extension on line 100, we call the method performSegue(withIdentifier: "segueToRoomViewController", sender: self) which will navigate the page to a new View Controller. The last extension has the prepare method. This prepares the View Controller we are navigating to before we get there. Now, let’s create the View Controller and the segue needed to access it. 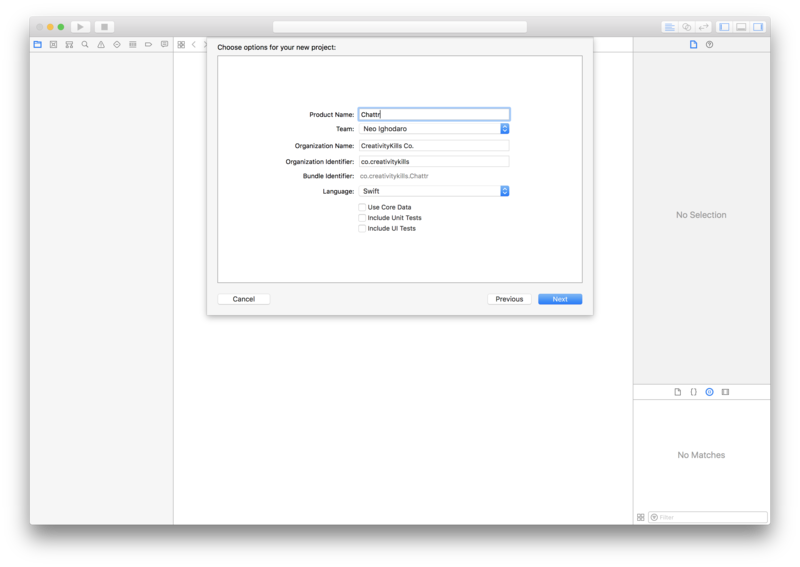 For our last storyboard scene, create a RoomViewController class. In the Main.storyboard file, drag in a final View Controller to the board. The class above extends SlackTableViewController which automatically gives it access to some cool features of that controller. In the code above, we broke the class into 5 extensions. Let’s take each extension and explain a little about what is going on in them. In the first extension, we subscribe to the room, set the room name as the page title and configure the SlackTableViewController. In the configureSlackTableViewController method, we simply customise parts of our SlackTableViewController. In the second extension, we override the table view controller methods; we set the number of sections, the number of rows, and also the Message to be shown on each row; and we also calculate the dynamic height of each cell depending on the characters the message has. In the third extension, we have the didPressRightButton function which is called anytime the user presses send to send a message. In the fourth extension, we have the functions available from the PCRoomDelegate. In the newMessage function we send the message to Chatkit and then we reload the table to display the newly added data. In the fifth and final extension, we define functions that are meant to be helpers. The PCMessageToMessage method converts a PCMessage to our own Message struct (we will define this later). The sendMessage method sends the message to the Chatkit API. Finally, we have the messageCellForRowAtIndexPath method. This method simply gets the message attached to a particular row using the indexPath. 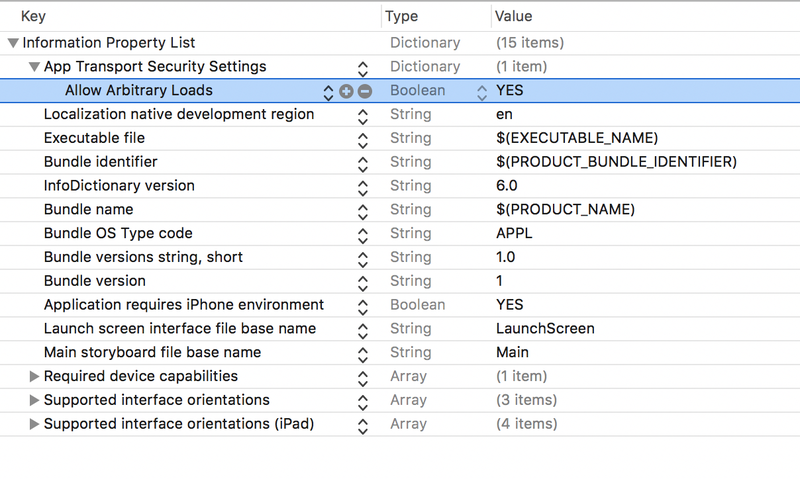 In the code above, we create a class that extends UITableViewCell. This class is going to be used by SlackTextViewController as the class for each message row. It was registered in the RoomsViewController when configuring the SlackTextViewController. With this change, you can build and run your application and it will talk directly with your local web application. Now you can run your application. In this tutorial, we were able to create a simple chat application using SlackTextViewController and the power of the Pusher Chatkit SDK. 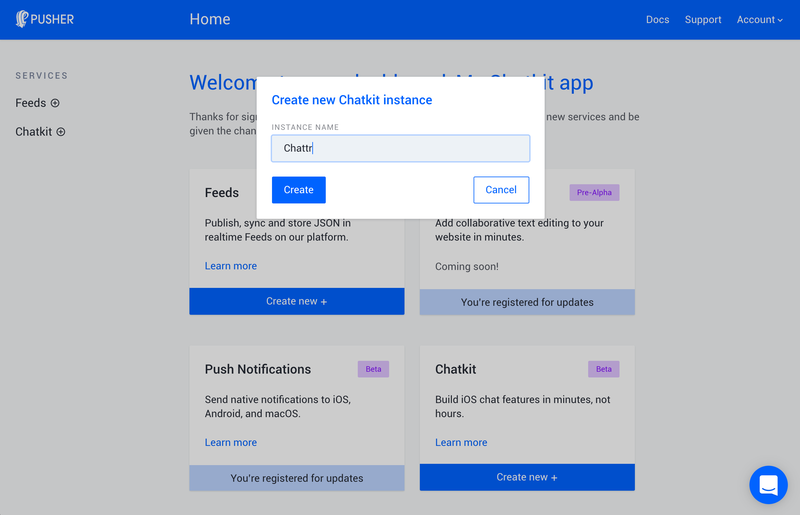 Hopefully, you have learned a thing or two on how you can integrate Pusher Chatkit into existing technologies and how it can power messaging in your application.